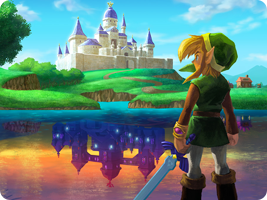 The Legend of Zelda is a fantasy action/adventure set in the kingdom of Hyrule. As the legendary hero, Link, you explore the land, fight monstrous creatures in maze-like dungeons and solve tricky puzzles. You will often be saving Hyrule's Princess Zelda from the clutches of the demonic Ganon. The legend itself can be a puzzle. You are not always playing as the same Link, but a lineage of characters who acquire the name 'Legendary Hero', the Triforce of Courage and the Master Sword.